The Many Faces of Milan. Italy’s financial center and fashion capital, Milan, was the hub of my recent trip to Italy. It is a fascinating and stylish mix of old world charm and modern design. Although my stay there was mostly work related (no I don’t work in finance or fashion, but they also host one of the top ranked European business schools), I will share a few experiences and observations I made while crisscrossing the city. A pleasant surprise, a treat actually, came on my second day in Milan. A memorable dinner at Castello Visconteo. This castle, built in the 14th century, is just over an hour’s drive from Milan. Incredibly charming and a bit mysterious when you arrive at night. I couldn’t get enough of the beautiful decorations, still partly preserved on the walls and ceilings. And the 5-course candlelit dinner was delicious, traditional dishes from Lombardy accompanied by Tuscan wines. I couldn’t take too many pictures at the table, but had to sneak a shot of this perfect Italian version of Crème Brule. Once my work was done and I had some time to look around, I realized Milan was quite a green city. And I don’t mean the parks. I noticed that people had surrounded themselves with greenery right where they lived. Rooftop gardens, terraces and balconies with green plants were everywhere. I started snapping pictures of a them as I passed different buildings in the city center. Here’s a small sample. The most amazing green buildings I encountered, however, were the two towers of Bosco Verticale (Vertical Forest) opened in 2014. Together, these two residential high-rise buildings host over 100 apartments and 20,000 plants, among them about 900 trees. I could only get a picture of one of them, but you’ll get the idea. 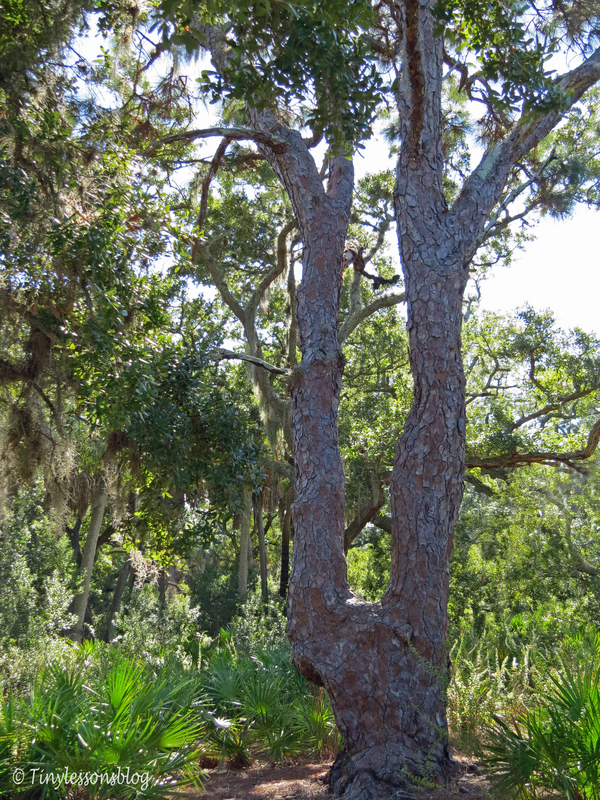 These trees, shrubs and other plants fight air pollution. They can transform approximately 44,000 pounds of carbon dioxide into oxygen each year. Quite amazing, isn’t it? Needless to say, I was impressed by these green marvels, designed by the Italian architect Stefano Boeri and a large team of specialists. Milan’s financial power and famous design were evident in the many modern glass towers reaching up towards the sky in the city center. From looking up, I went to looking down. The traffic scene on any street always included scooters. In fact, one could see long lines of them for rental at some street corners. And I noticed the many innovative parking practices. Here just one example. From looking down, I went to looking through…the shop windows at Galleria Vittorio Emanuele II, the worlds oldest shopping mall. Its construction started in 1865, but there was nothing old-fashioned about it. This mall housed shops of the famous designers of our time. 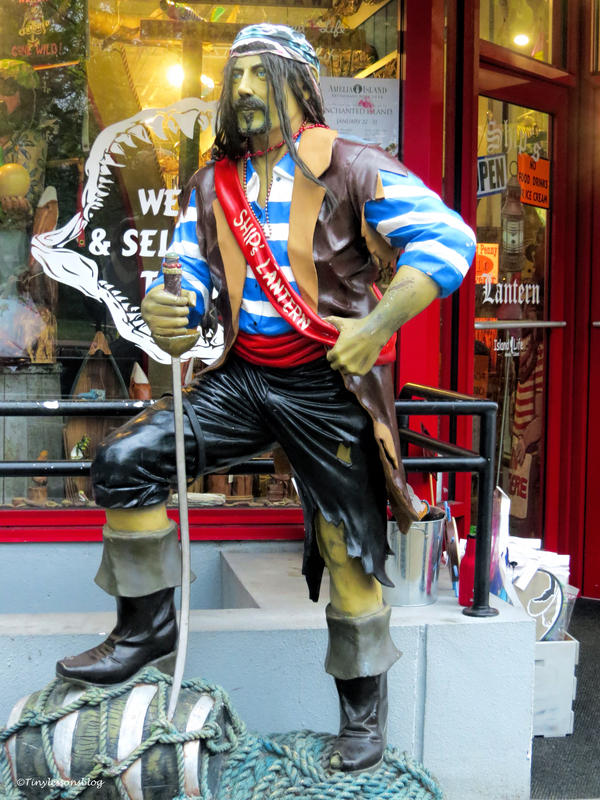 I went window shopping and saw whimsical fashion creations…some more suitable for the cat walk than my walk-in closet. Or my wallet. And I saw winter gear in muted colors. More my style, with Florida length cropped pants and all, but my wallet still didn’t agree. …and I passed many windows exhibiting exuberant, colorful bags. The price tags were discretely tucked under the bags, and I guess for the typical customer the price didn’t really matter. I have never been a bag lady, but they were nice to look at. After seeing this pom-pom-fitted head-gear, I gave up. I would not leave with any of those fancy shopping bags with a world-famous designer’s name on it. So I walked out. And was faced with a wall of faces. A modern touch on old walls right next to Piazza del Duomo, which is the main city square in Milan. I walked closer and saw the Duomo, Milan cathedral, in all its beauty. Lots of people and pigeons outside, but the inside was very peaceful. I spent some time there in silent contemplation. And lit candles for each of the two men I lost recently. When I came out I was greeted by a street musician and the many pigeons calling this square home. I noticed the lion was yawning…and took it as a sign it was time to catch a bus back to my hotel. Thank you for joining me on this mini-tour. The always scary-looking beast, Mr. D., and I wish you all a wonderful Halloween week. Mysteries in the Fog. Big Guns. And Other Adventures on Amelia Island. “Look farmor”! For those uninitiated in Swedish language the latter stands for grandma. “There’s a big bird, take a picture”! 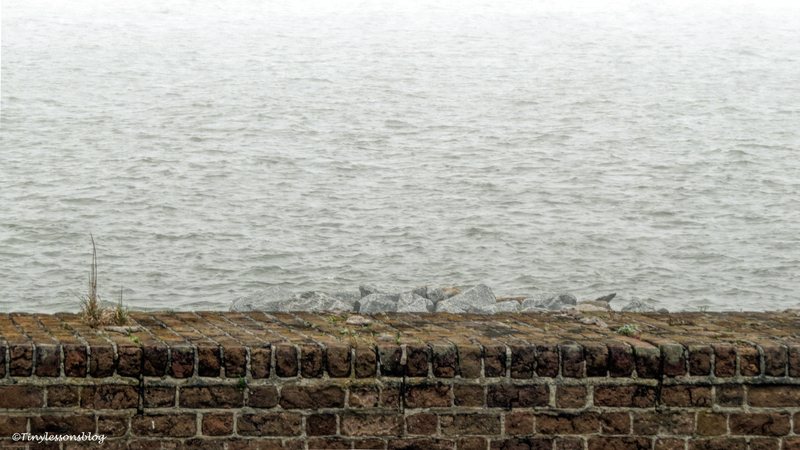 That was my fellow photographer, aged 5, pointing at the foggy skies. As you can see, I followed her advice. 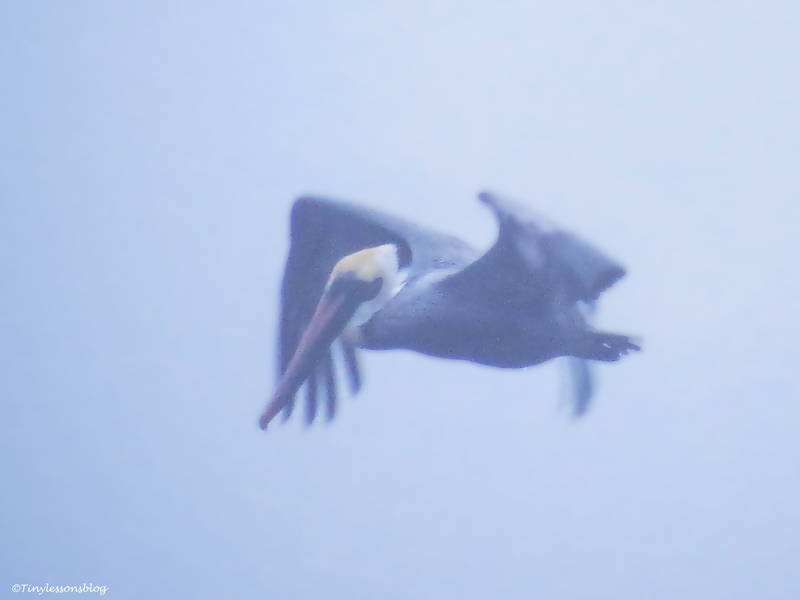 A Brown Pelican was indeed flying in the mist over the ocean scanning for fish. Unfortunately it was not successful, but who would’ve been? 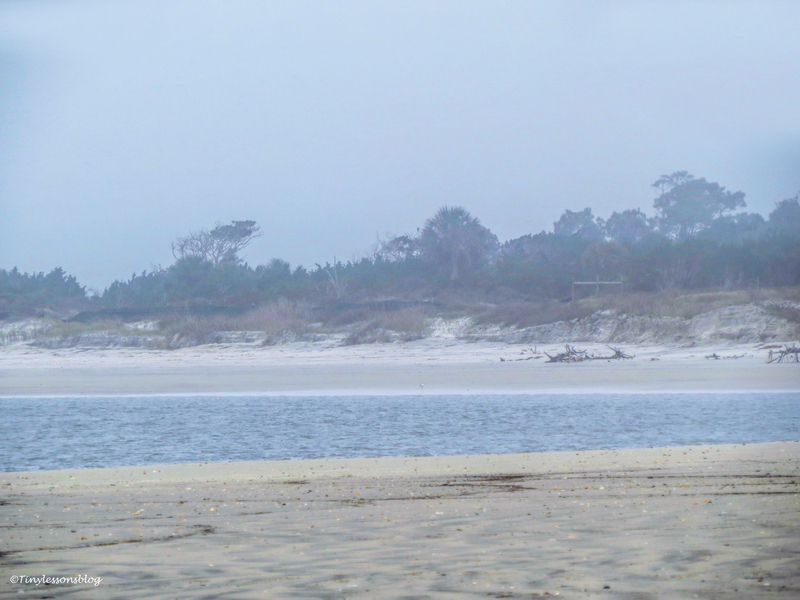 The fog effectively merged the sky and the white hats on the ocean. 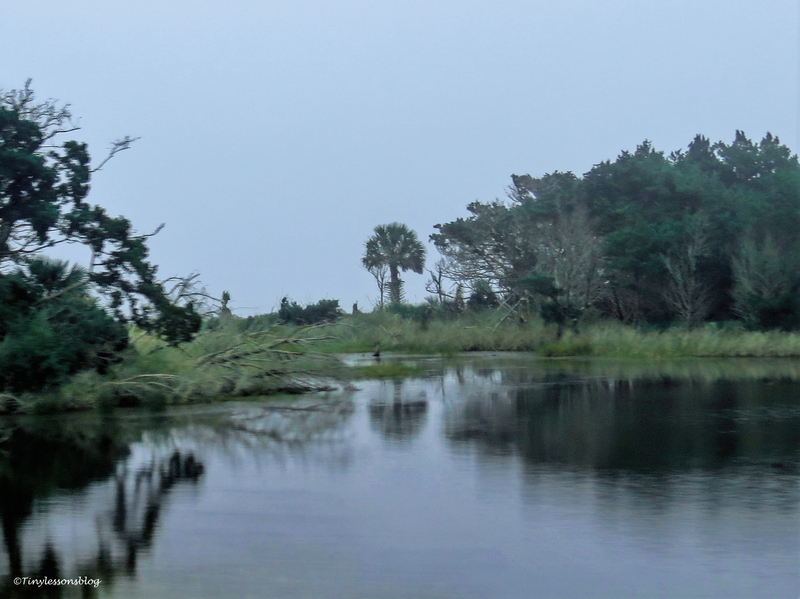 Despite the fog and the wind, our trip to Little Talbot Island, one of the few undeveloped barrier islands in North Florida, was one of discovery. 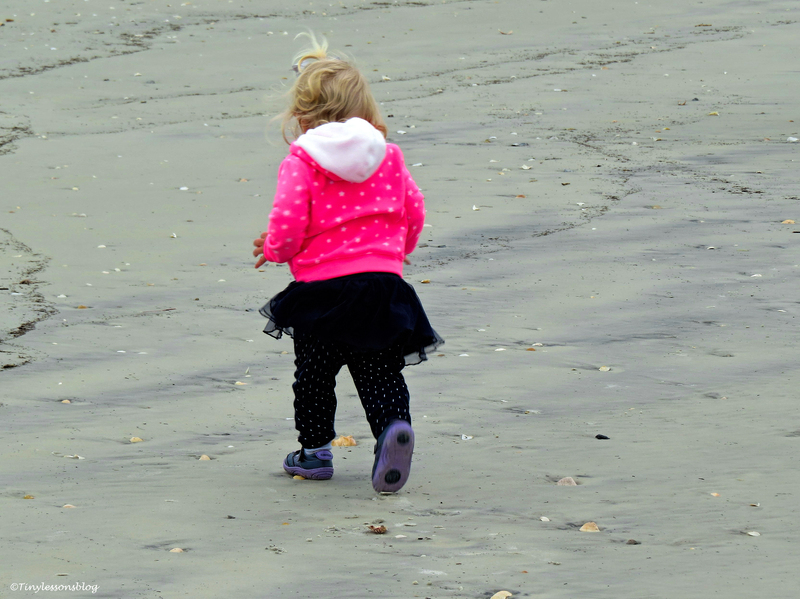 We had a wonderful, energetic “guide”, aged less than 2, who picked up some of the small treasures in the sand for closer examination. And pointed out a few big ones. 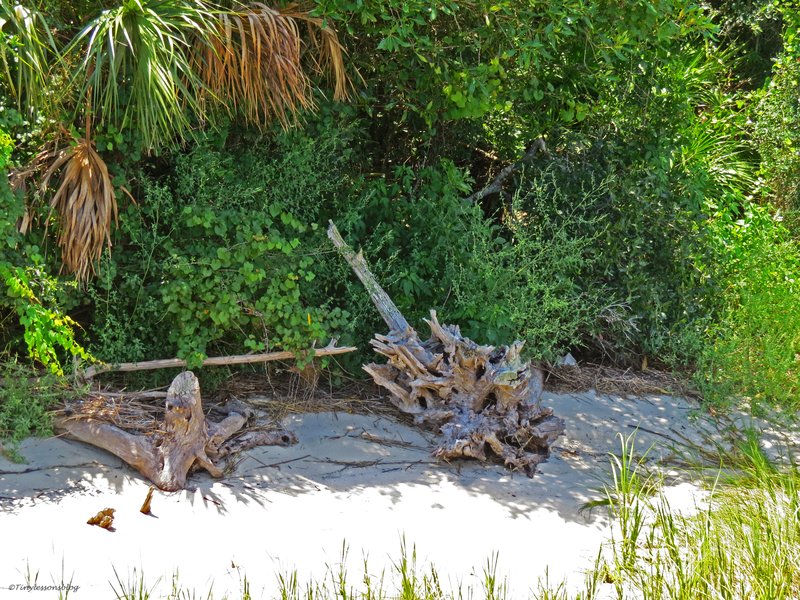 Like this mysterious palm trunk that had spent a considerable time traveling in the ocean. It had to be investigated. 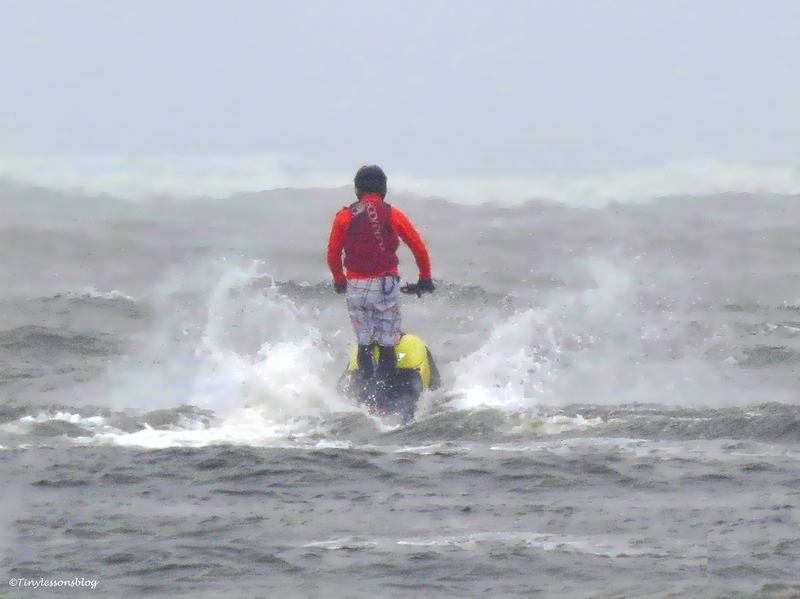 We also spotted a lone soul on the ocean braving the wind and the rough seas. 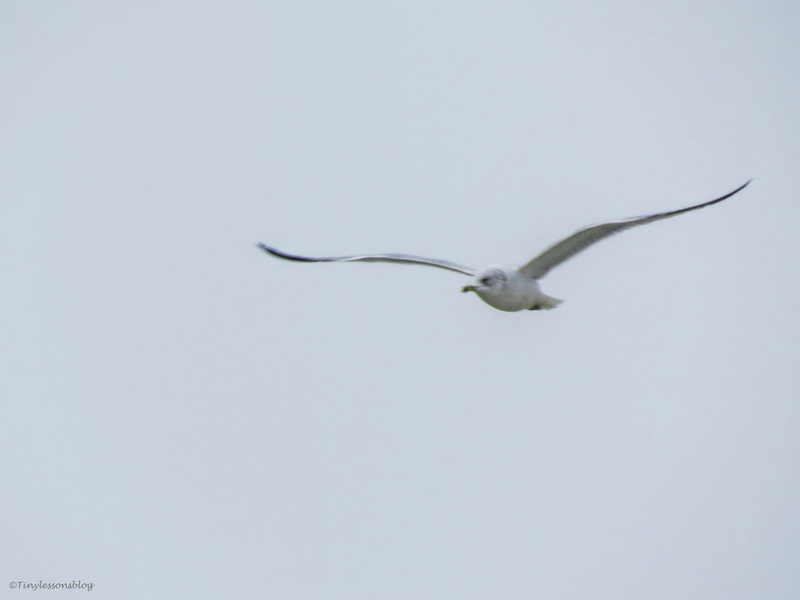 And a gull keeping an eye on him. On a sunny day, this beautiful beach would probably have been very busy, but we had it all for ourselves. 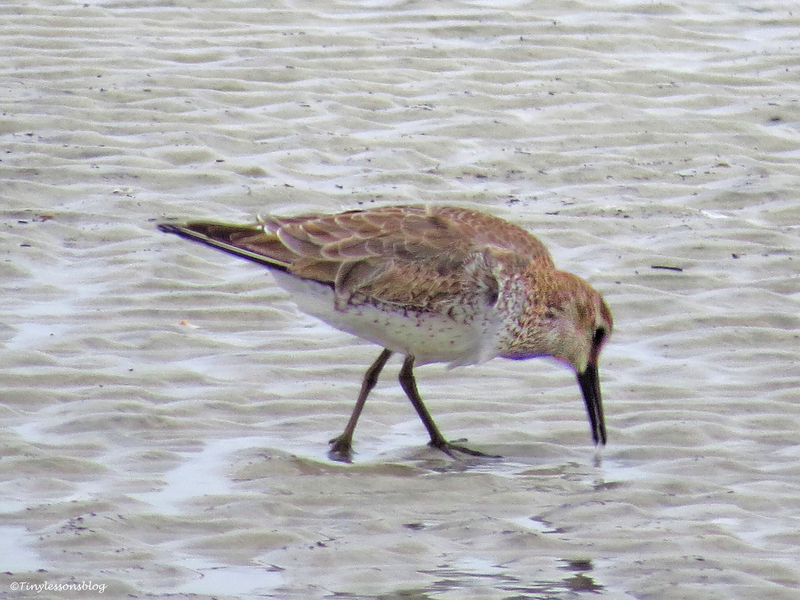 Apart from a couple of Western Sandpipers. 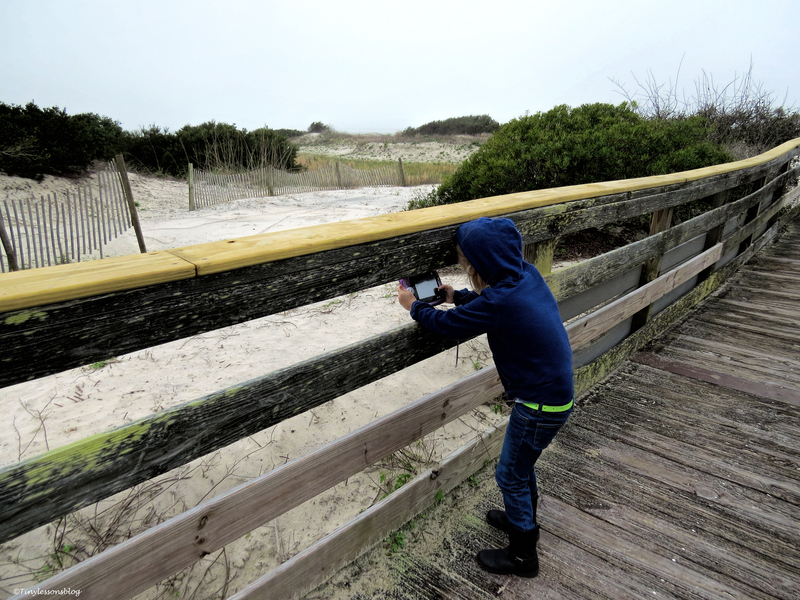 Walking back from the beach with a bag full of treasures, the Leap Pad photographer took pictures of the boardwalk and the sand dunes. She already has a well developed eye for discovering interesting items to shoot in the nature. But the excitement was not over yet. 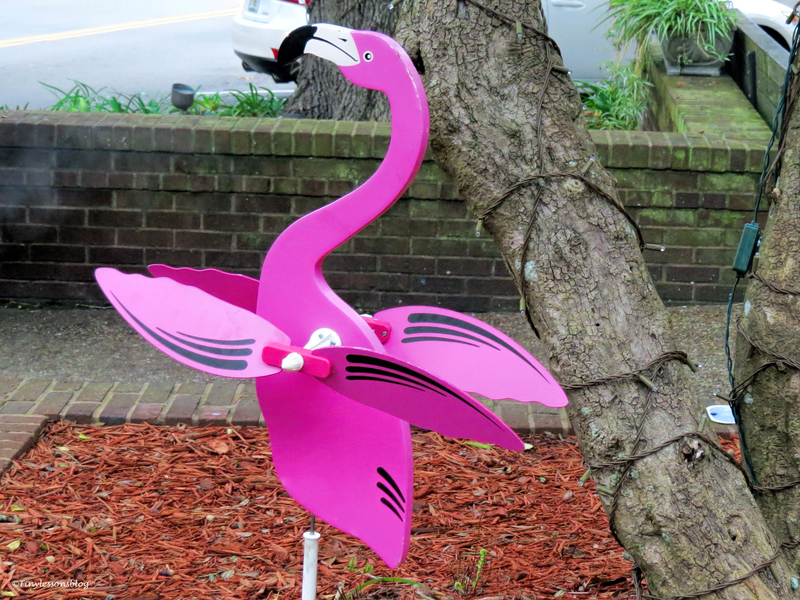 Our journey continued to Amelia Island. Despite the dense fog we could enjoy some beautiful views from the car windows. 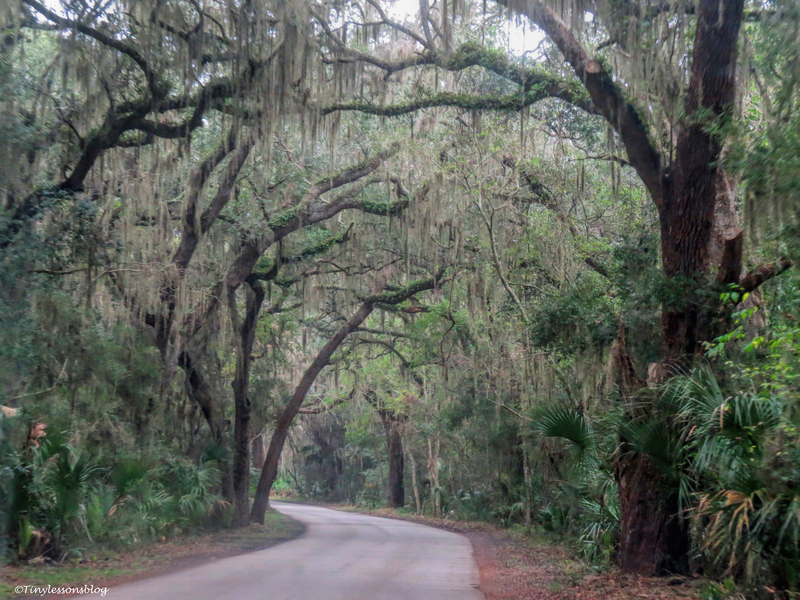 Once on Amelia Island, we drove along the Canopy Road leading to Fort Clinch State Park. 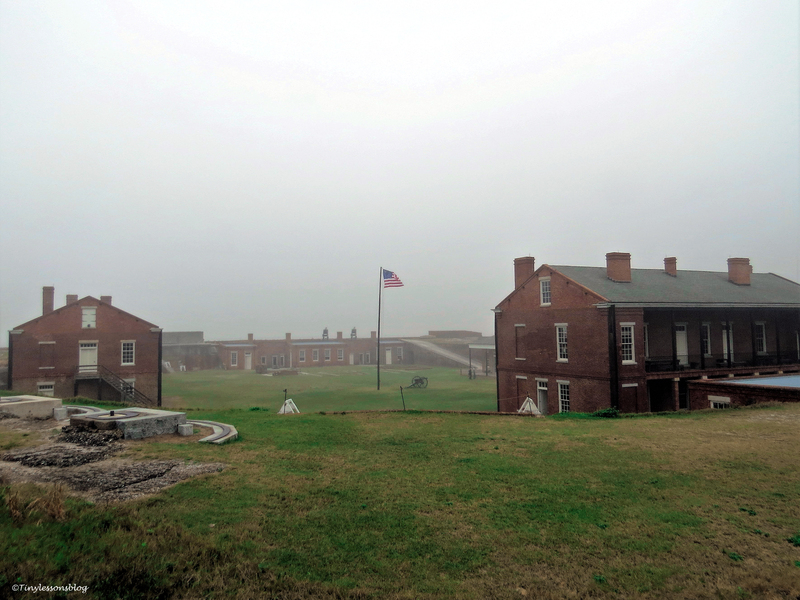 Our adventure would continue at this historic fort, built in 1847. 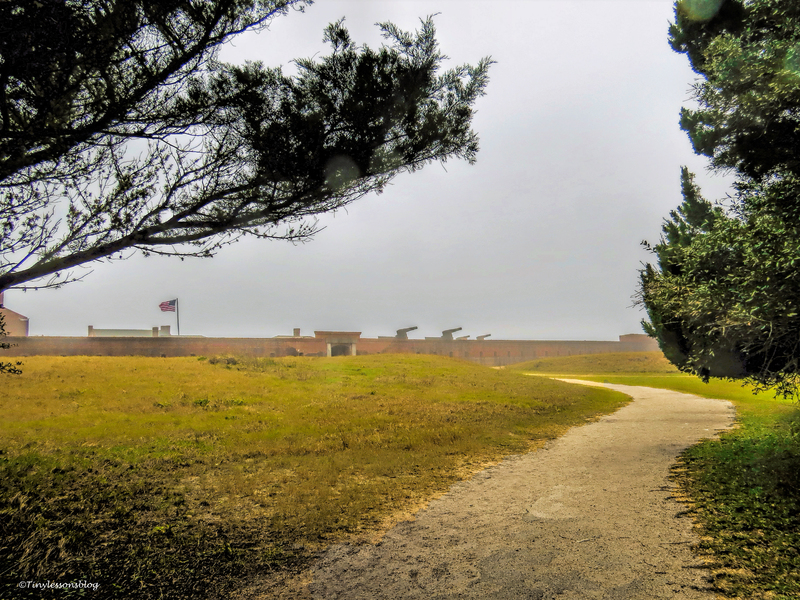 It served as a military post during the Civil War, Spanish-American War and World War II. 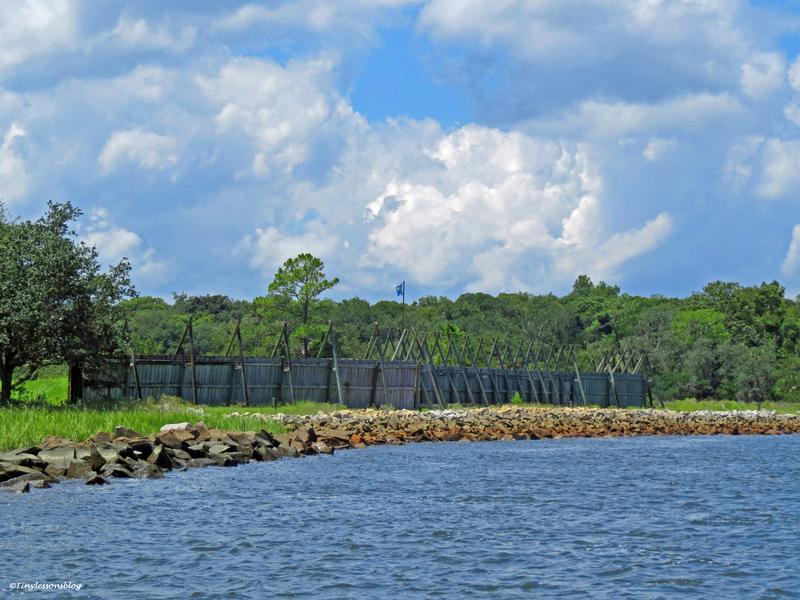 The fort stands on a hill facing open waters. Already the draw bridge and the outer walls were impressive. 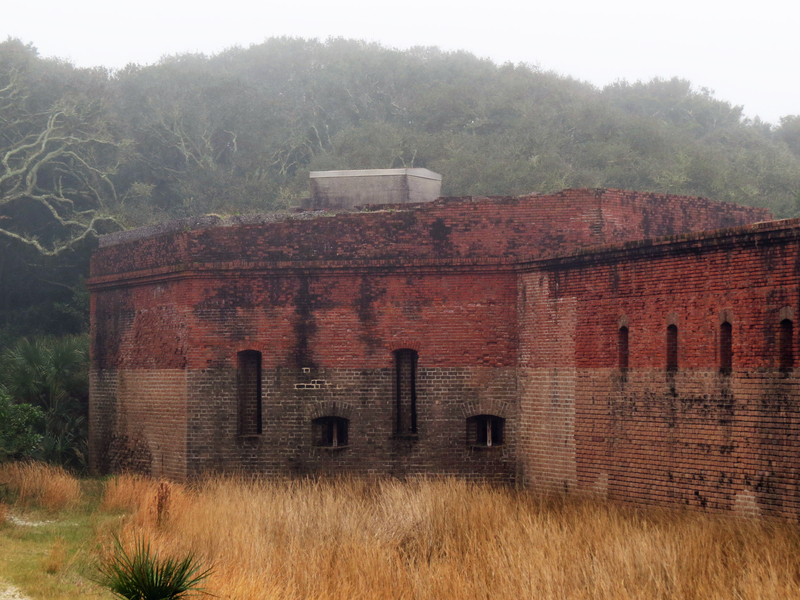 And the buildings inside the fort were surrounded by big cannons. 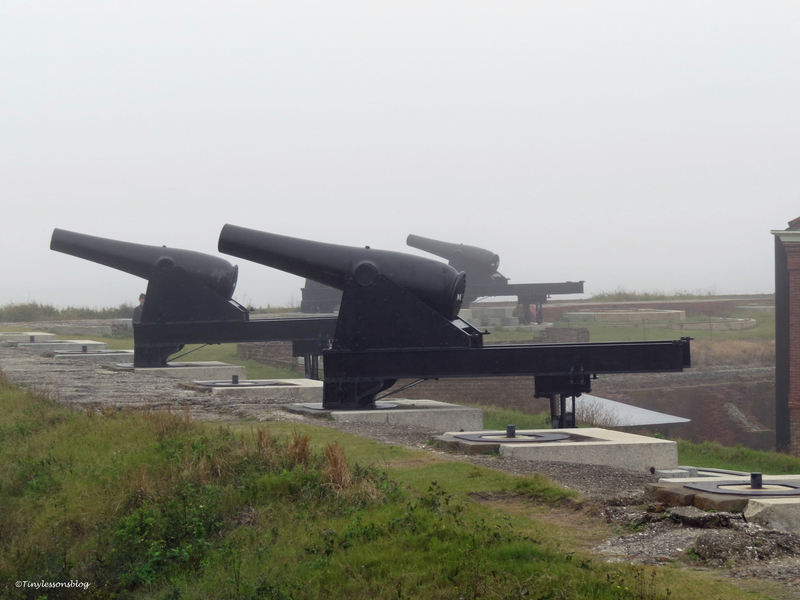 Quite a few out of the originally 77 big guns still remained in place. We climbed up to the watch tower ruins through some very narrow, winding iron stairs. Those days they didn’t bother about railings, and it was more like climbing up inside a chimney, but up we came. On a clear day the view would’ve been fantastic, but now we could hardly distinguish the water from the sky. 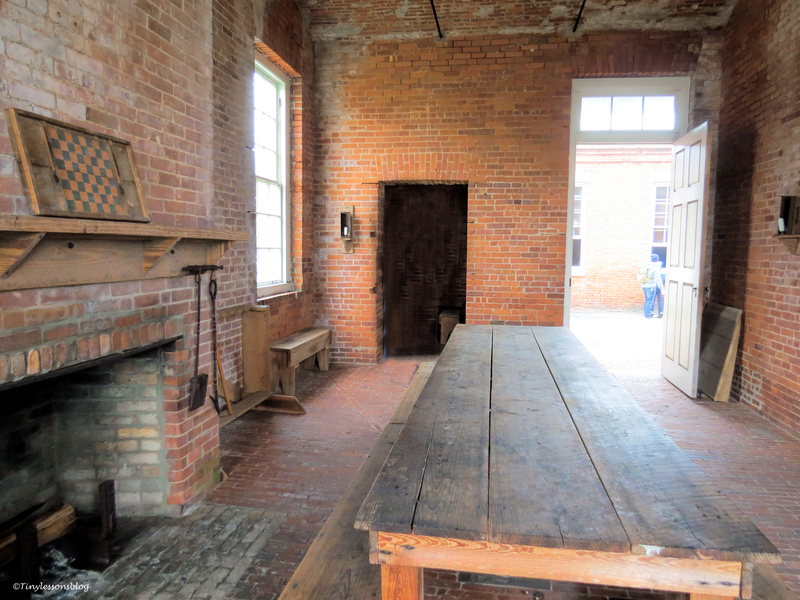 To our delight, we could also tour many of the buildings. 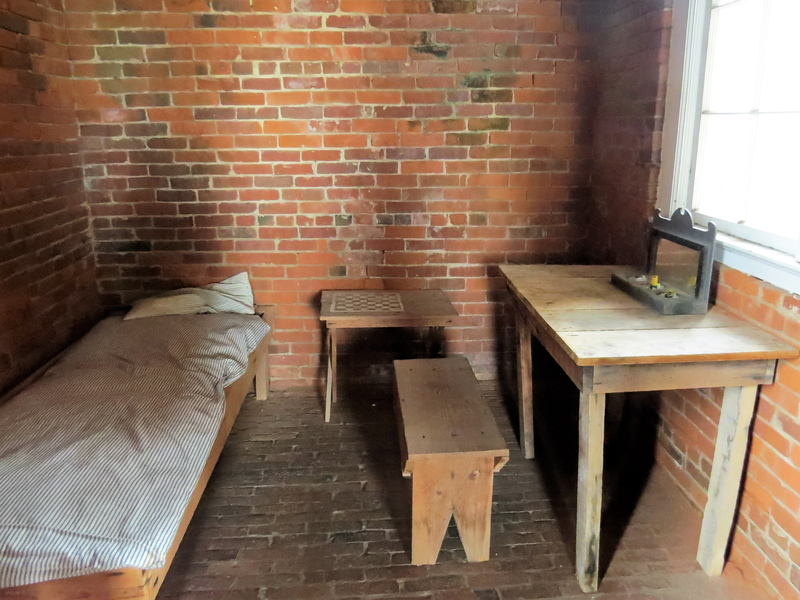 We found sleeping quarters, dining halls, captains quarters, and a prison. All of which had to be documented by the two photographers. By this time, our guide was out of energy and had to replenish it by taking a short nap. 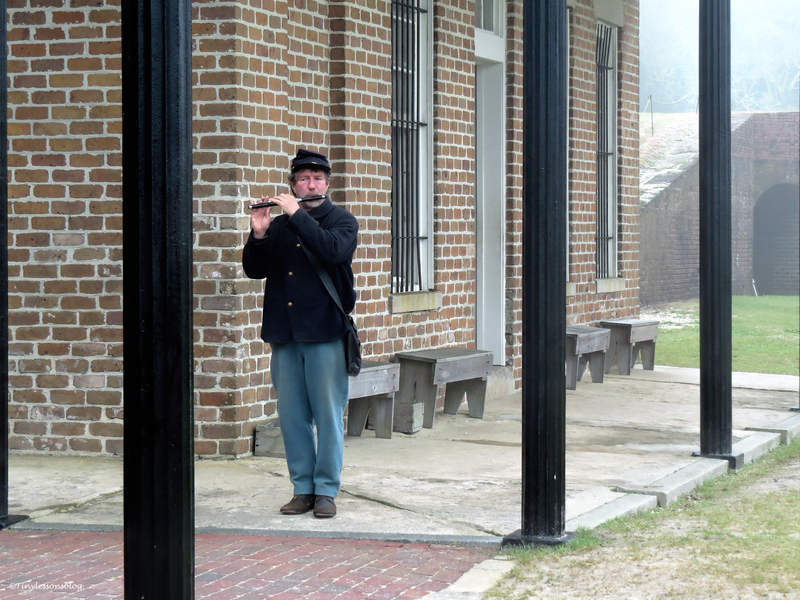 When we had climbed enough and examined everything, a Union soldier entertained us by playing jolly old melodies on his flute. 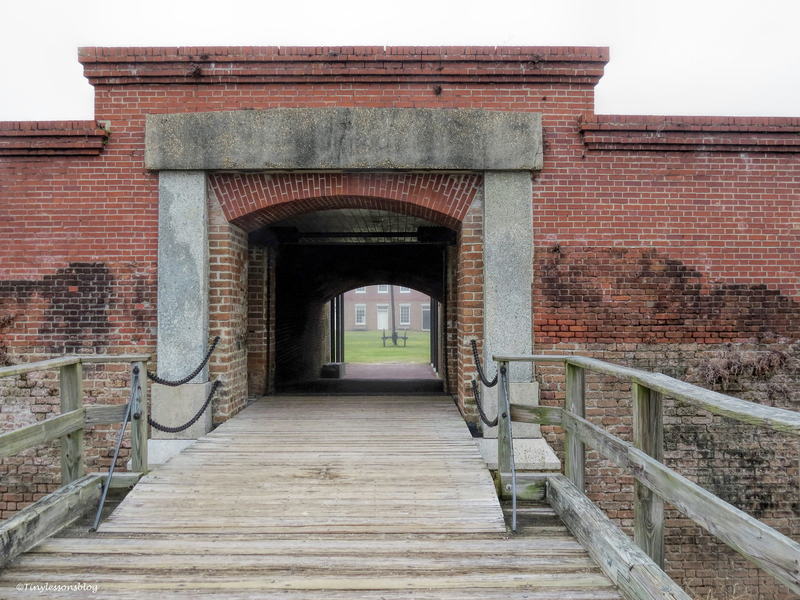 From the fort, our adventure continued to the historic district of Amelia Island. 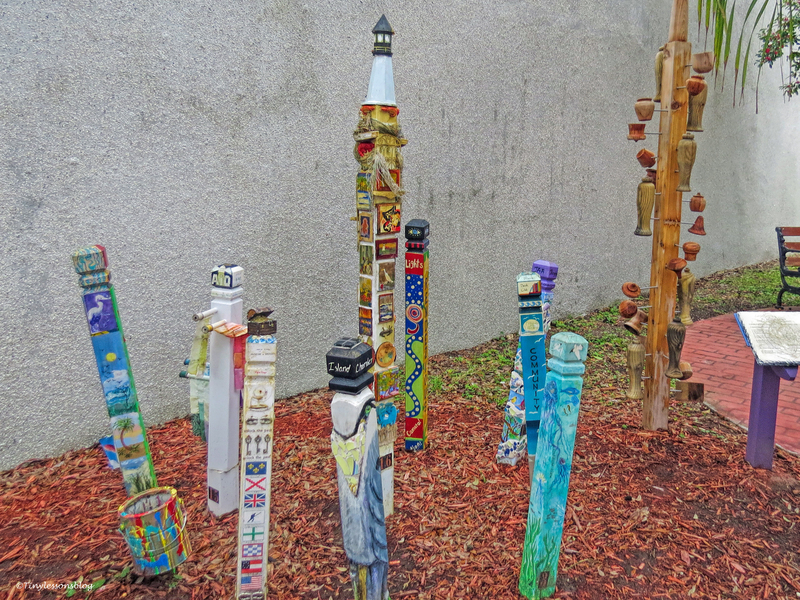 A fun and “artsy” place. 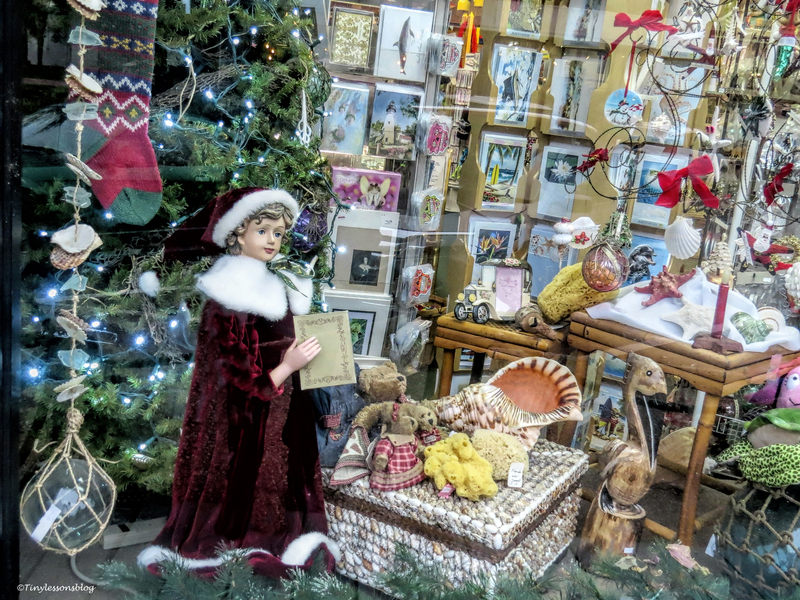 Art works were displayed inside and outside the galleries, Christmas decorated shop windows and streets dotted with pirates and birds that didn’t fly away from the photographers. Cool shops where our young photographer and the little guide, now reinvigorated, could try their hand on all kinds of modern inventions. Entertaining indeed. By the time our shopping was done it was getting dark. Our troops were ready for dinner at the seaside. 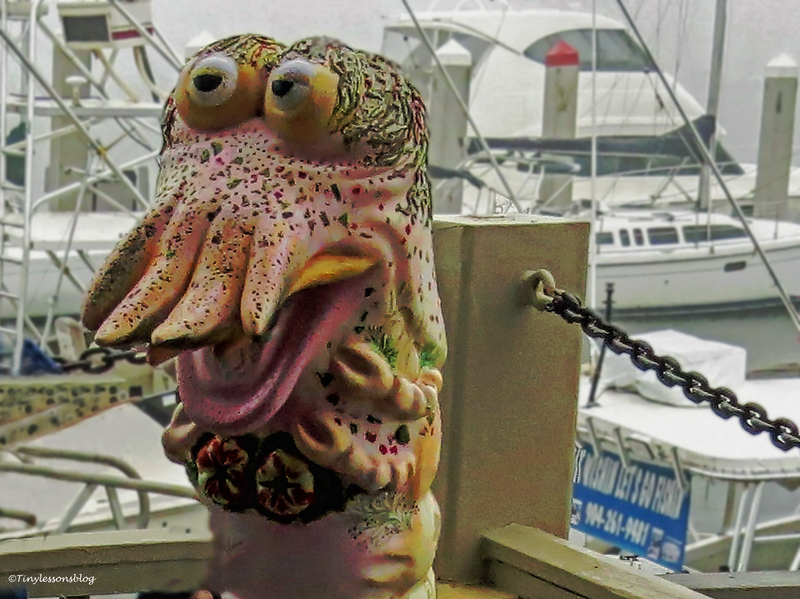 Tired, but happy like the shrimp greeting us outside the restaurant. That was a foggy good adventure! 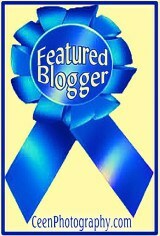 Thank you for tagging along. Just a brief post to say hi. 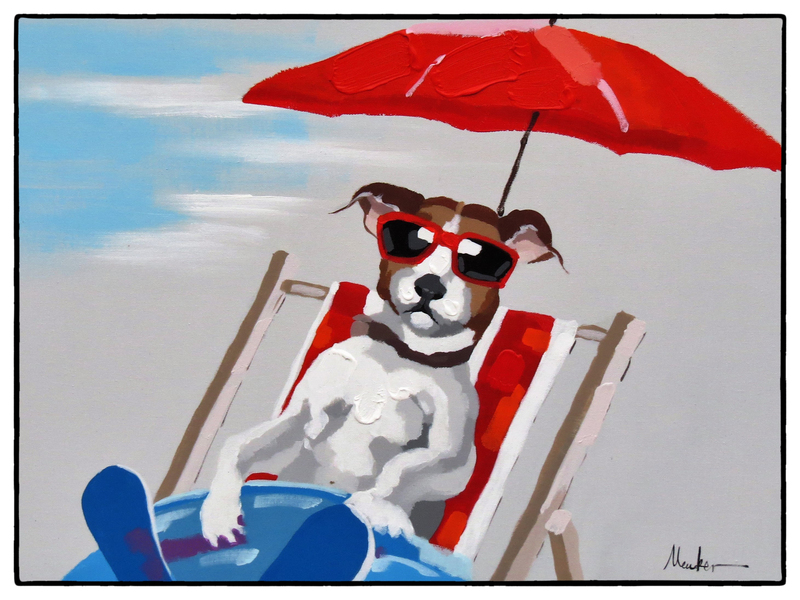 I’m back home and trying to catch up on all the wonderful posts you, my friends, have produced while I was away. 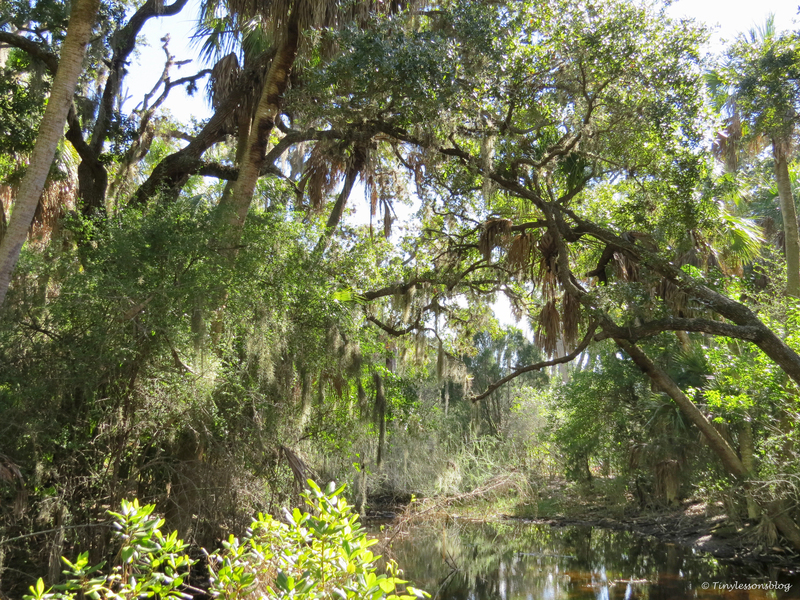 I had a whirlwind trip, but managed to get in a couple of hours of hiking on Saturday in the Timucuan Ecological & Historical Preserve along the St. John’s River in North Florida. 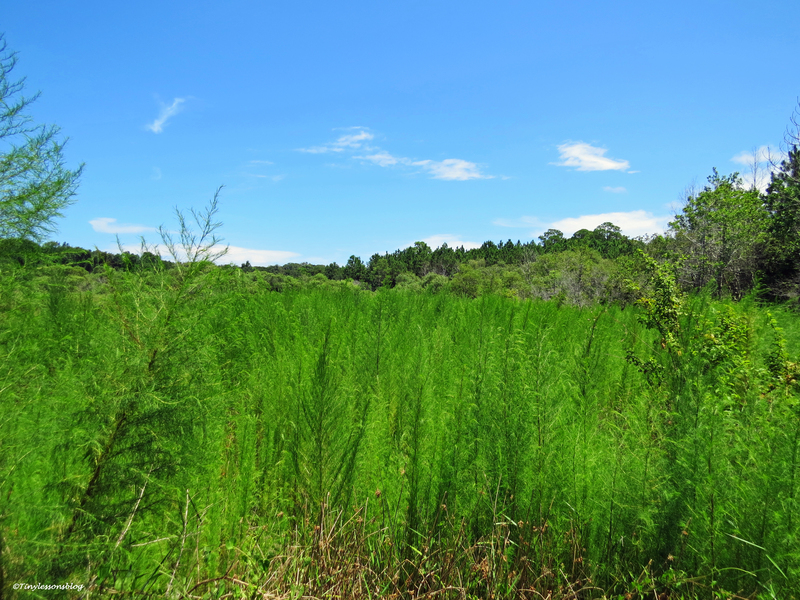 This huge and very interesting preserve represents one of the last unspoiled coastal wetlands on the Atlantic Coast. 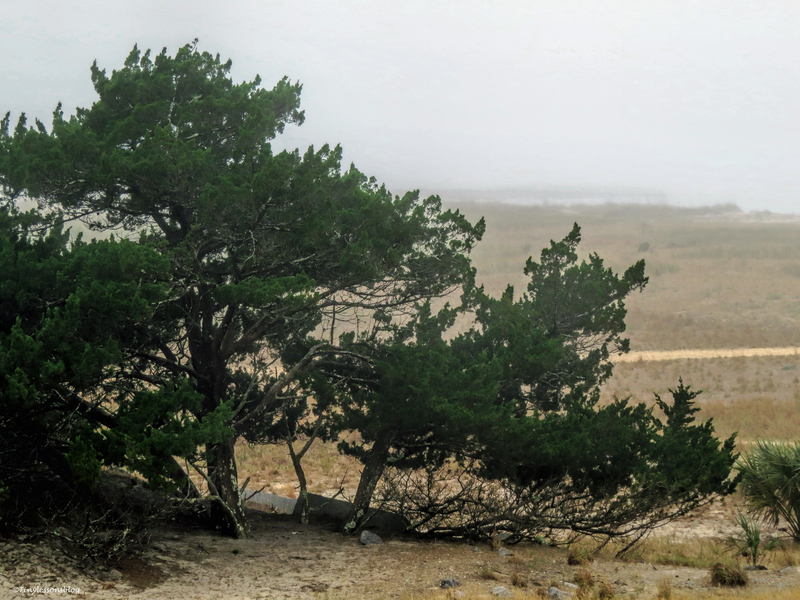 It would have required at least a full day or two to properly experience the beauty of its salt marshes, coastal dunes, and hardwood hammocks. And to explore 6000 years of human history within it boundaries. 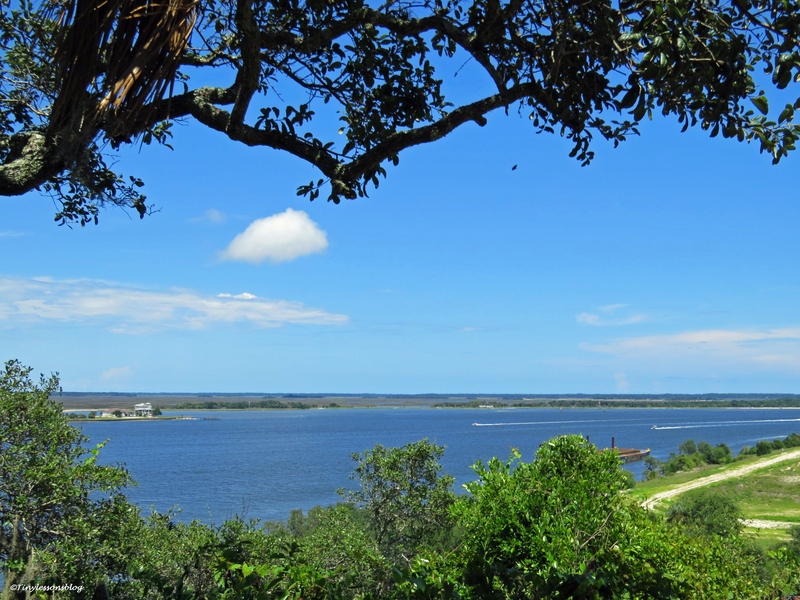 This preserve marks the place where one of the Timucuan tribes met the first French explorers in 1562. 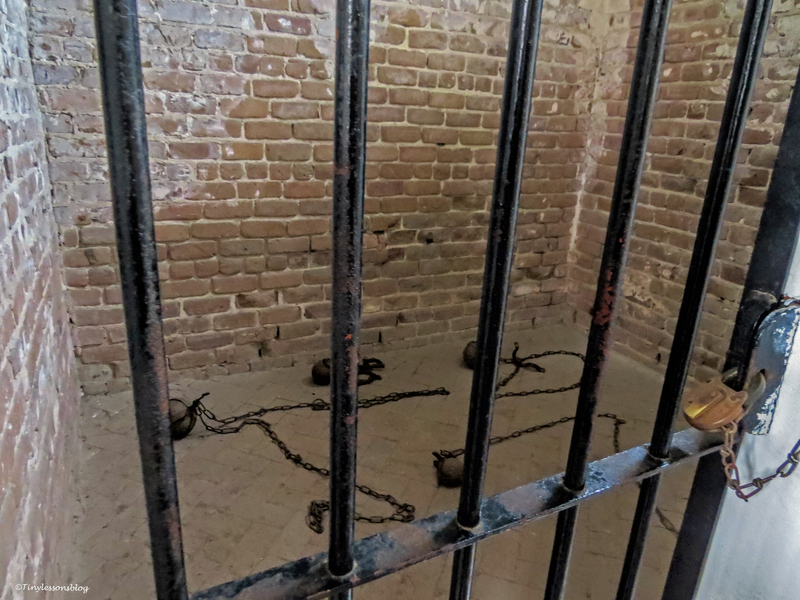 Sadly, this meeting, and the French and Spanish settlers that soon followed, represented the beginning of the end of the longstanding Timucuan culture. 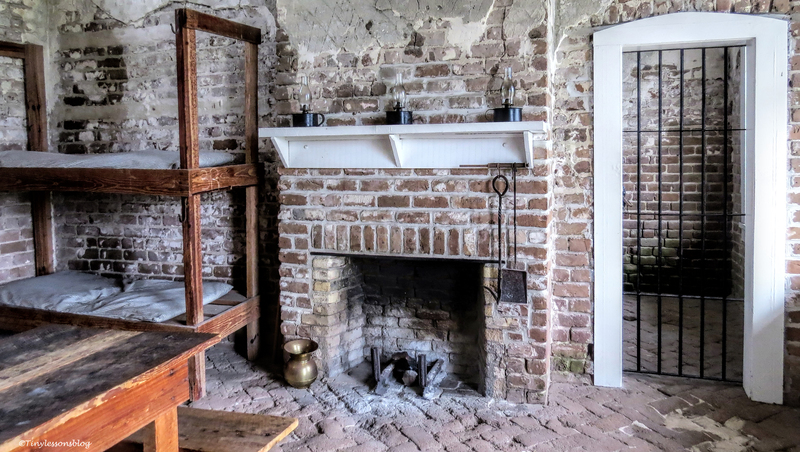 The preserve also houses an exhibit of Fort Carolina originally built by the first French settlers on the river bank. We didn’t have the time to reach the wetlands where I could have found birds to “shoot”, but I could hear them everywhere in the jungle-like forest. 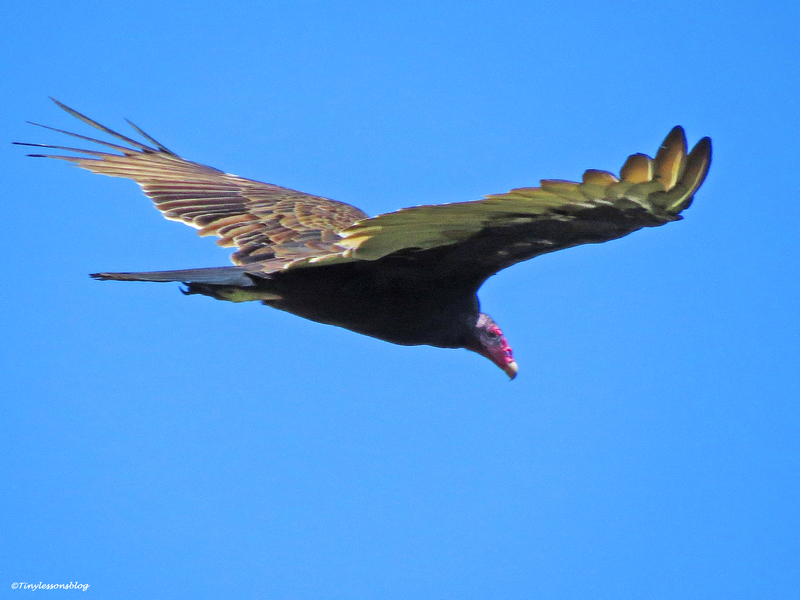 The only bird I managed to capture on this short hike was a Turkey Vulture who enjoyed the winds above the river. 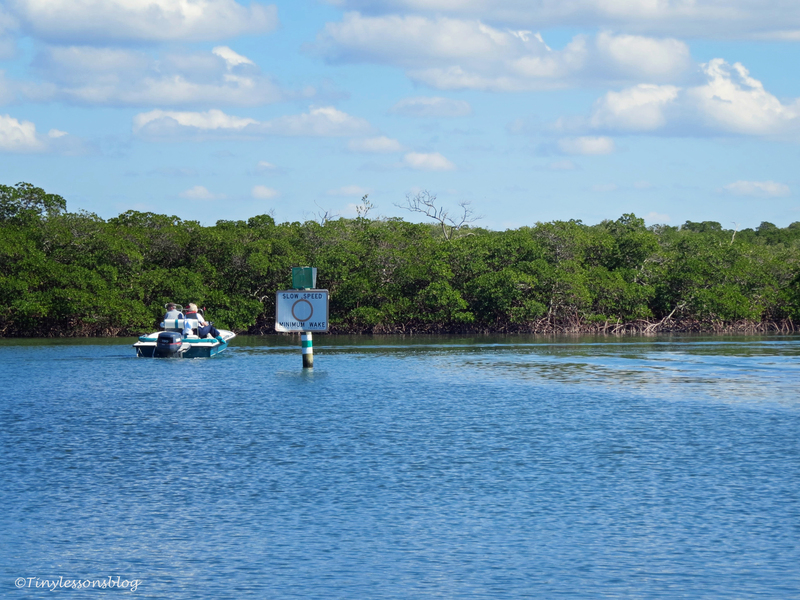 Stopping along the river we spotted several schools of dolphins, most of them too far out for me to get a picture. 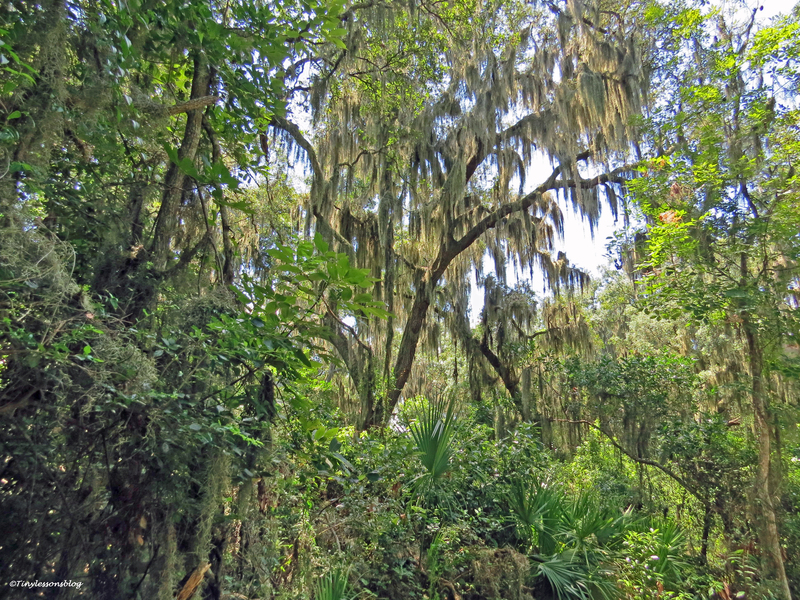 The preserve also has ongoing ecological research projects in the many different types of habitats it houses. 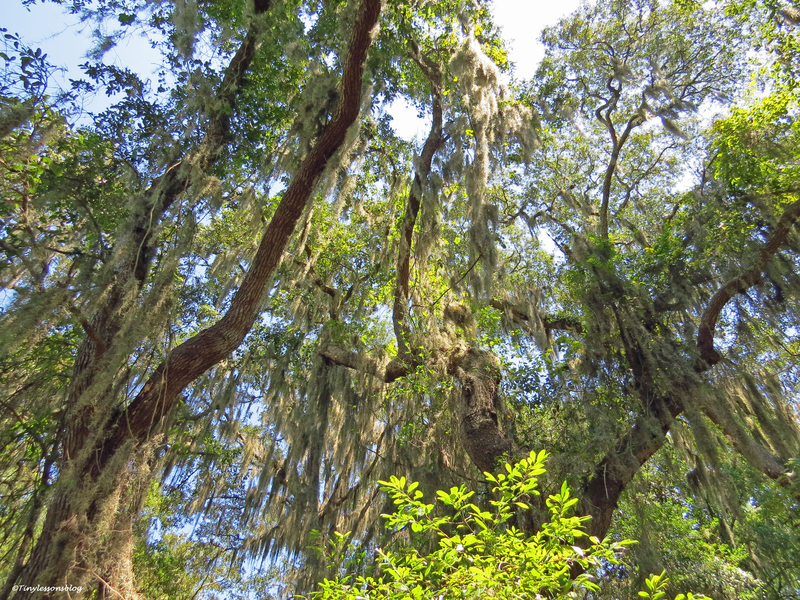 We stumbled upon one of the vegetation projects on our hike through the maritime hammock. It was a compact hike, but gave me a taste of what this preserve has to offer. 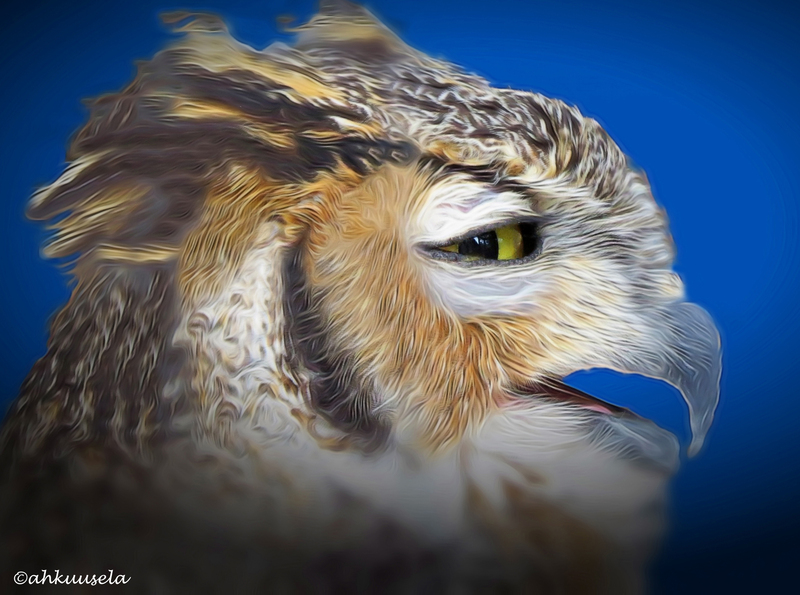 I hope to return one day with better time to explore the beauty of its habitats, and its birds, properly. I hope your week is going great. Get out and enjoy nature! 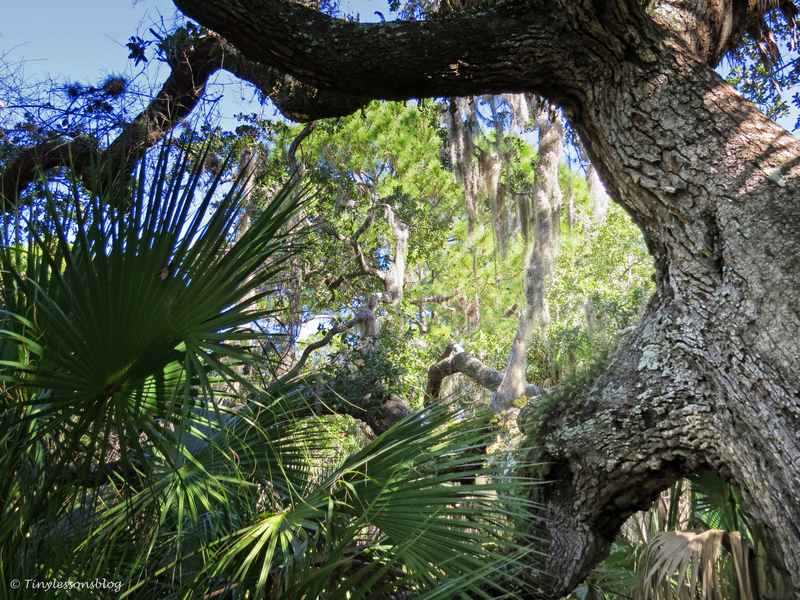 Tiny – here leaning on a “twin” tree in the hardwood hammock. Silence Breathes in Colors. On Caladesi Island. One morning at the end of January, I set out with a friend just after sunrise. 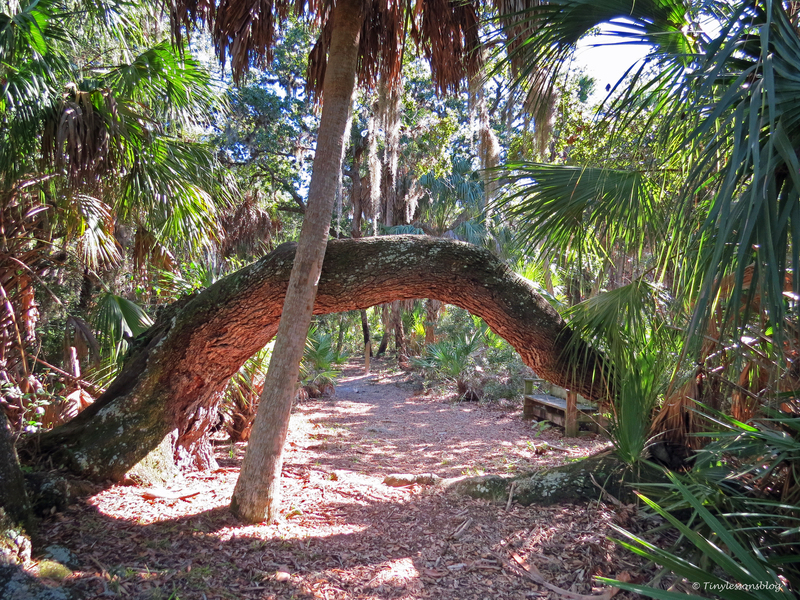 She had agreed to join me for a hike on Caladesi Island, one of the few remaining pristine barrier islands in the Gulf of Mexico, situated a mile and a half off shore from the city of Dunedin, FL. 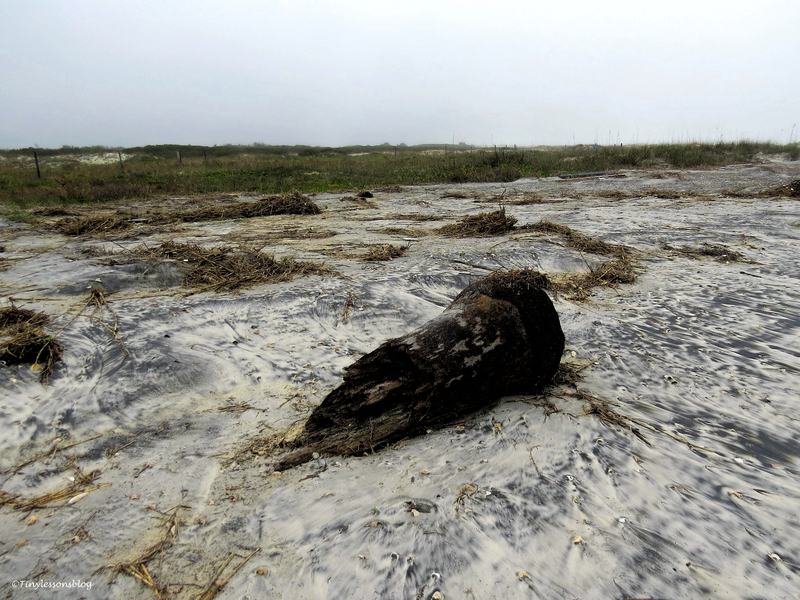 It was called Hog Island until 1921 when a major hurricane split it into two separate islands. The Hurricane Pass was formed. 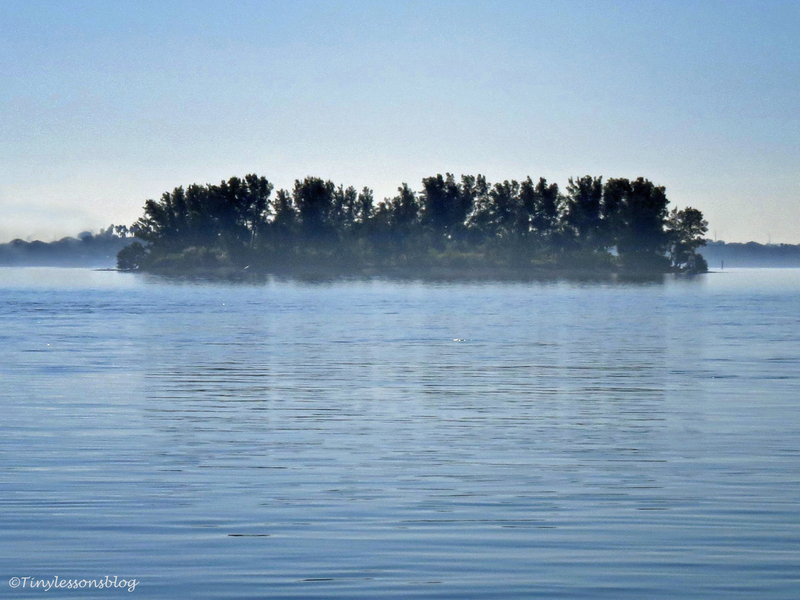 The northernmost island became known as Honeymoon Island after becoming popular with honeymooners in late 1930s. The southern island got its name, or so the story goes, after a Spaniard named “Desi” said to have lived on the island bayou, which is “cala” in Spanish. Caladesi. 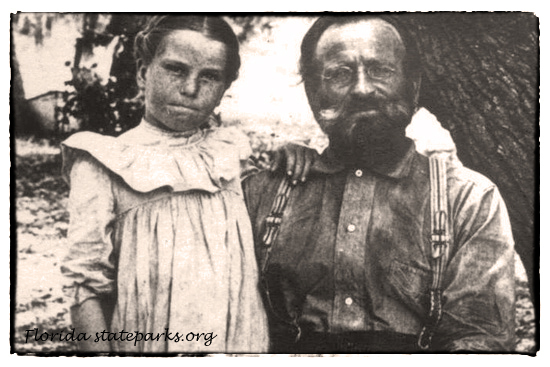 Caladesi Island, now a state park, was “discovered” in 1888 by a Swiss immigrant, Henry Scharrer, who became the first and only homesteader ever on the island. His daughter, Myrtle, who was born there in 1895, has written an interesting book, “Yesteryear I Lived in Paradise – The Story of Caladesi Island”, first published in 1984. 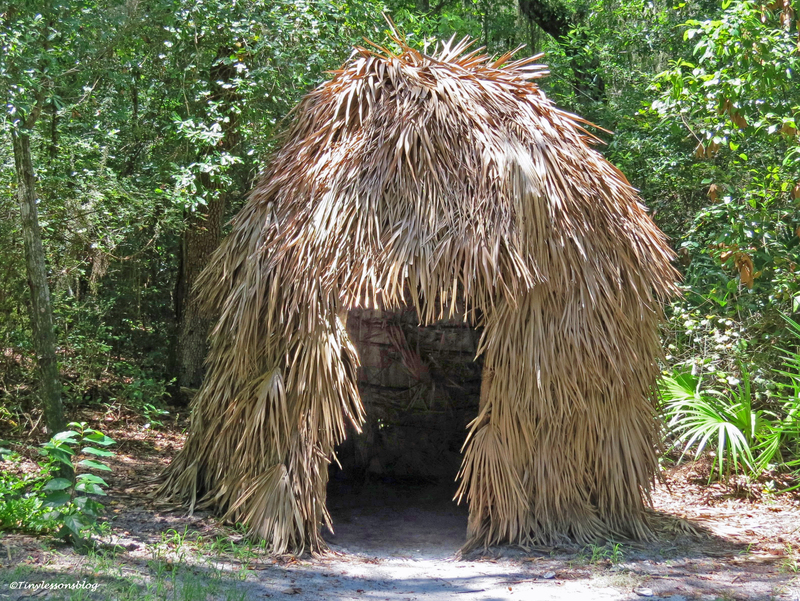 In the book, she gives a timeline of the area’s early history involving the Tocobaga, Seminole and Miccosukee people, and the Spanish – English – Spanish rule until the Florida territory was acquired by the U.S. in 1821. She also describes her family’s life on the island in late 1800s and early 1900s in vivid color and fascinating detail. We started our trip by driving to Honeymoon Island. From there we took the first boat of the day over to Caladesi. The air was cool. The ocean was completely still. 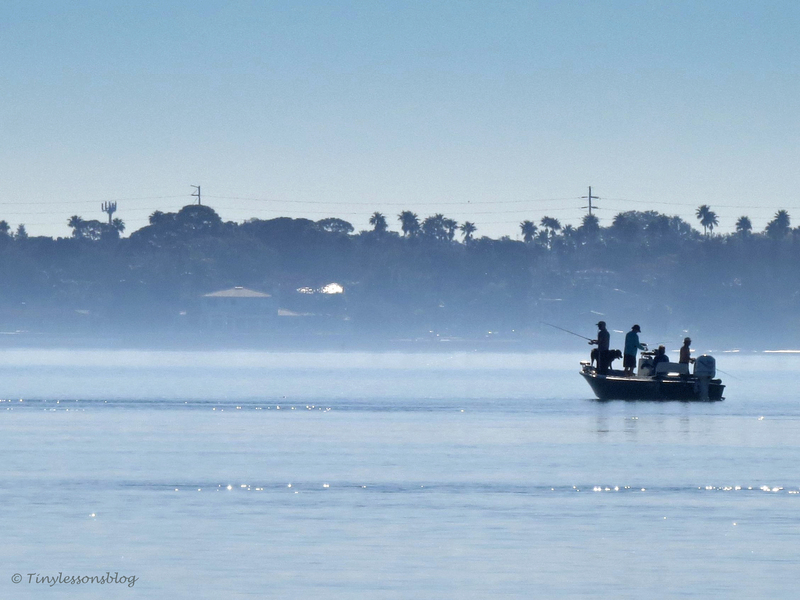 A light mist was rising from the water as the sun slowly climbed higher. Suddenly we spotted some movement in the water. 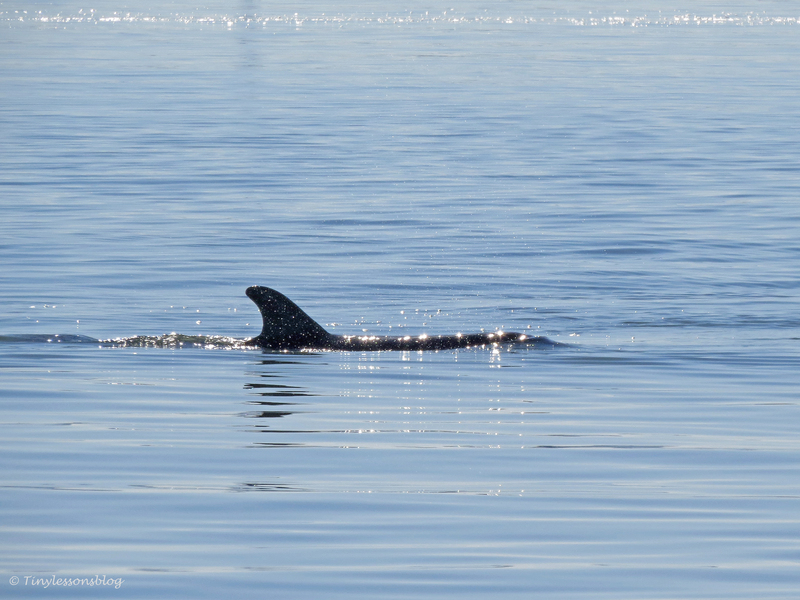 It was a bottlenose dolphin on a morning swim in the sparkling ocean. A few minutes later we passed the northernmost tip of Caladesi Island. 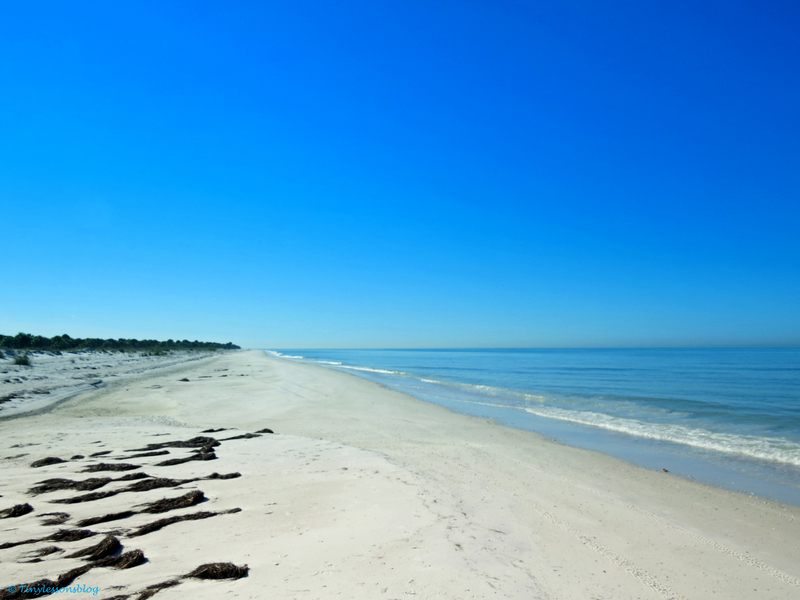 White sand, shore birds … and more dolphins, all swept in the soft blue of the morning. 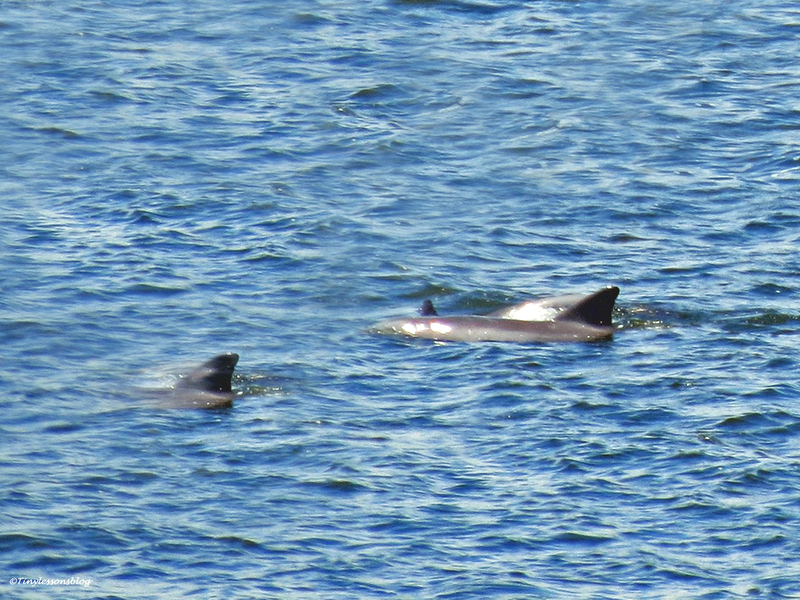 We watched them quietly for a while – and got another delightful surprise. 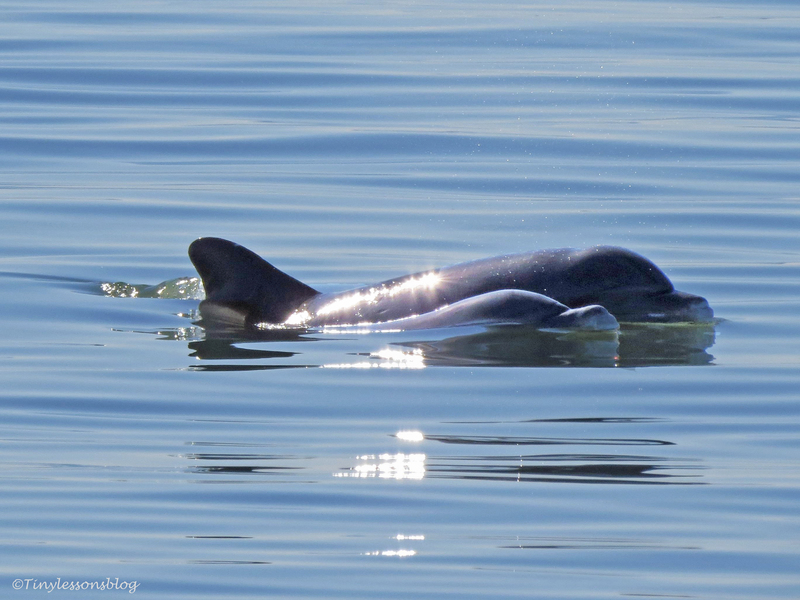 A mother dolphin with a baby beside her “floated” by on the other side of the boat. They might have been sleeping. It certainly was a dream-like moment. 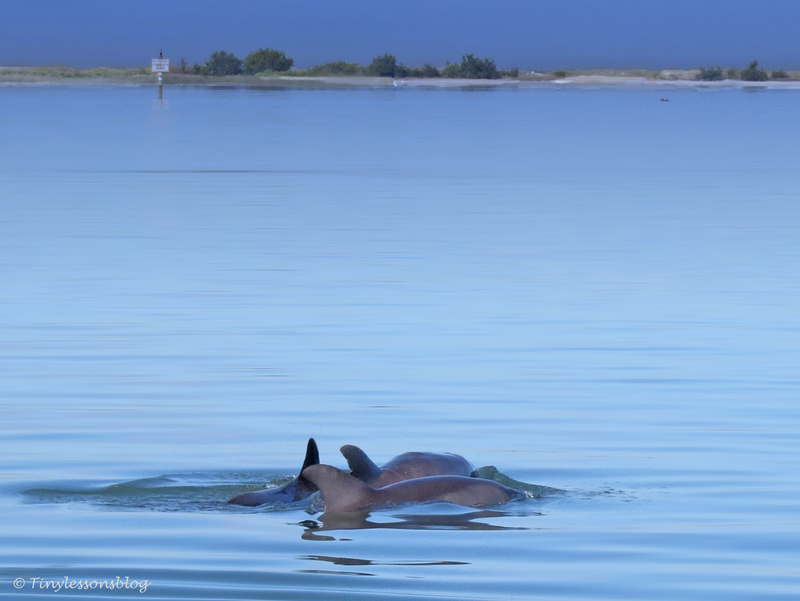 Dolphins are such enchanting beings, meeting so many of them first thing in the morning was a treat. The universe was smiling. The boat ride was short, about 20 minutes, and soon we started to navigate our way into the marina, the only establishment on the island. I was excited to finally experience the beauty of the island I had read so much about. The island is about six miles (9.6 km) long. We decided to start by walking south on the beach, and then hike the 3-mile (4.8 km) nature trail in the interior of the island. The beach was pristine, so beautiful I could have walked there for the whole length of the island! But we wanted to see more. 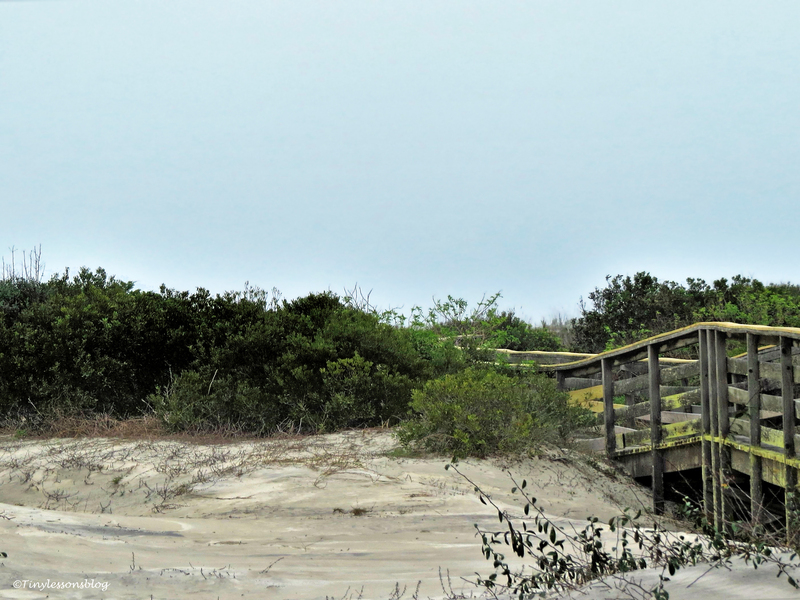 I knew that unlike Honeymoon Island, this was not a place where I could spot lots of birds inland, but I anticipated that the nature itself would be breathtaking. 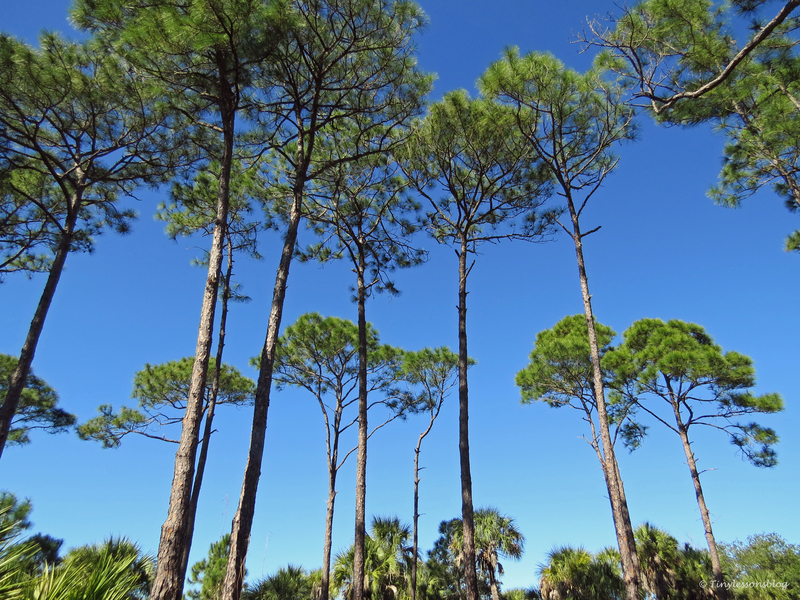 And it was, Florida in its natural state, as it used to be. 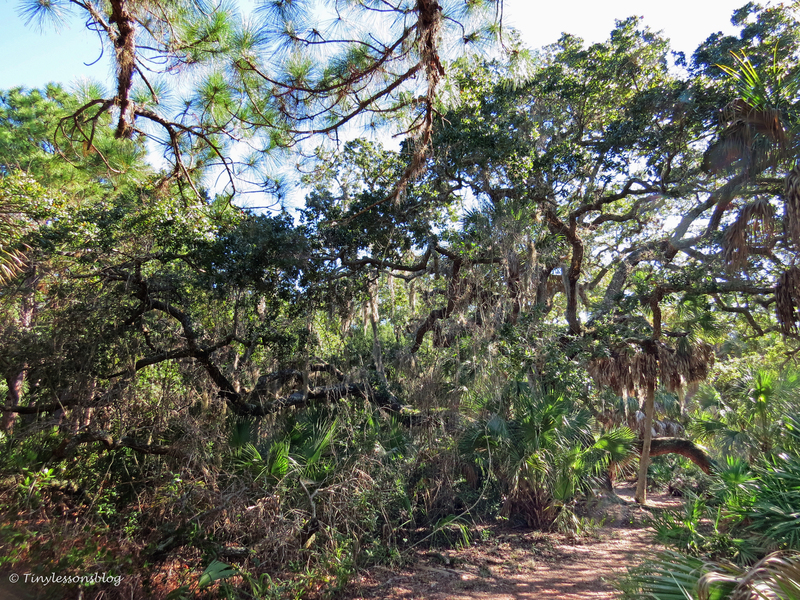 The trail passed through beautiful old pine, oak and palm forests. 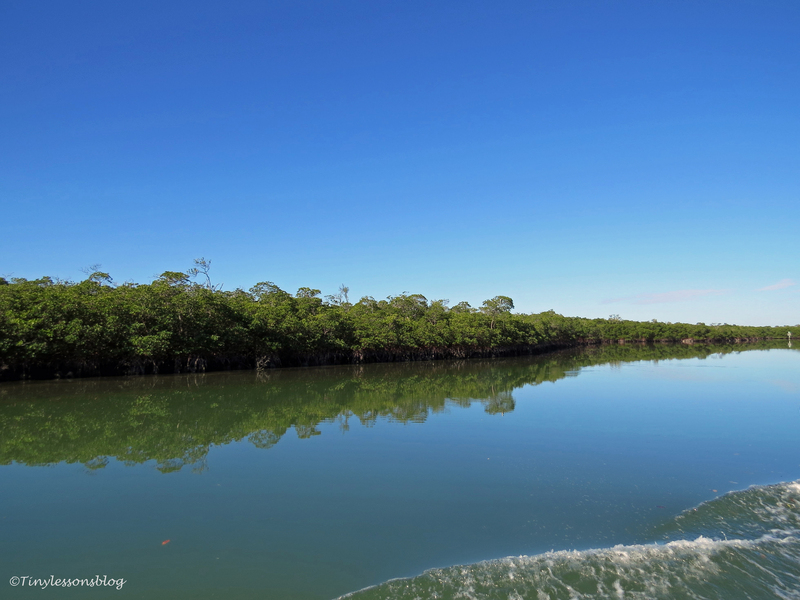 And soon we came across the beautiful waterway along which one could reach the interior of the island by kayak. 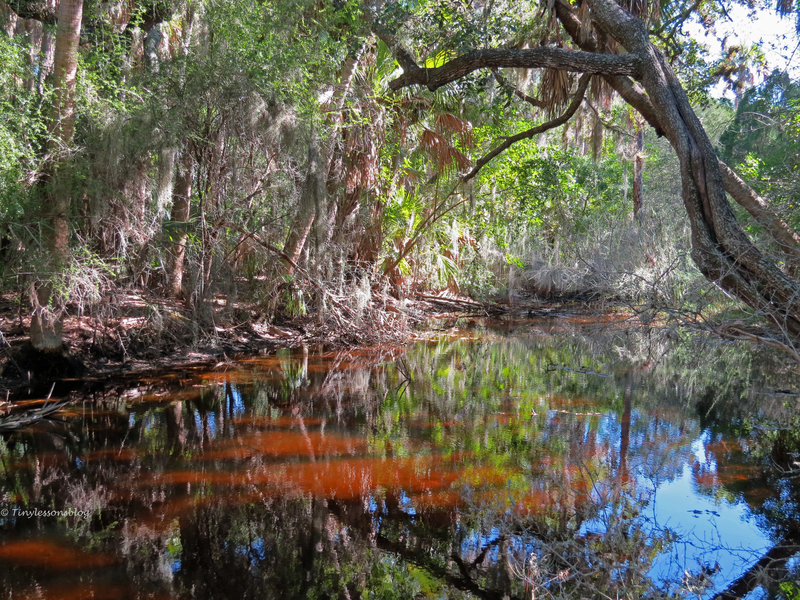 When we came closer to the former homestead, we found the only fresh water pond on the island. That’s where Myrtle and her family got their water for daily use. Trees were bending over the pond, as if protecting it from the passage of time. And silence… was breathing in mesmerizing colors. Fairly close to the pond, we literally stumbled upon the famous “Harp Tree” or twin pine as it’s also called. Numerous photos were taken there, and are exhibited in the book, by early photographers who came to the island to visit Myrtle’s family. It was a beautiful spot. I could feel the wing beats of history in the air. It was easy to imagine how life used to be there a hundred years ago, and how exciting photography had to be for these early pioneers. There would always be someone willing to climb up to be pictured sitting in the Harp Tree. Then the trail turned back towards north and the harbor. 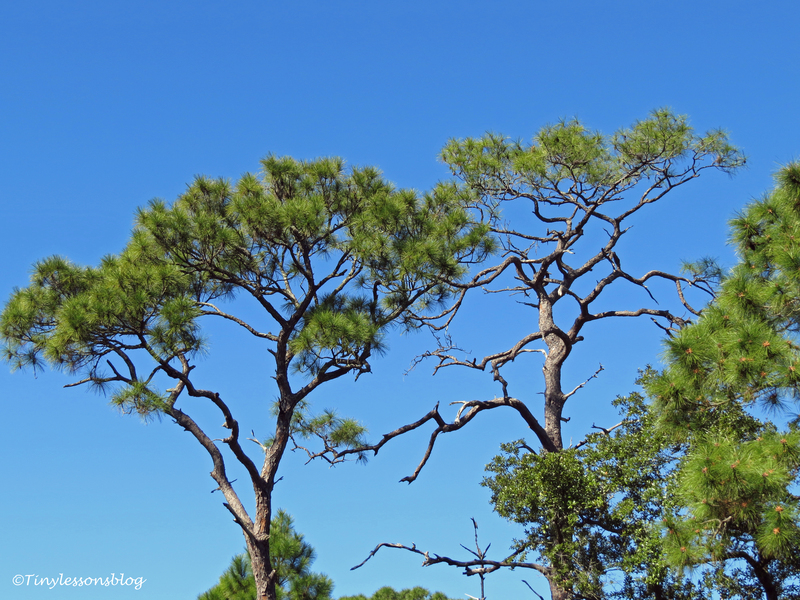 We were admiring the old trees when we heard some rustling in the bushes next to the trail. 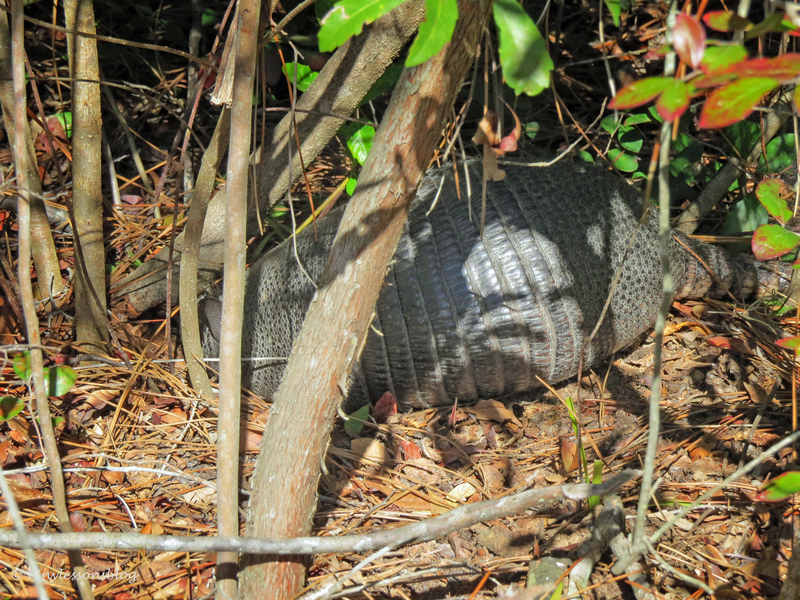 We stopped, looked carefully, and saw a nine banded armadillo trying to dig a hole in the ground, either to find food or to prepare a new burrow. His head was already far down there, and he was working hard. The last part of the trail was equally beautiful. I felt like I’d been thrown back in time. A harsh time in many ways, but much more simple and peaceful in this island paradise. 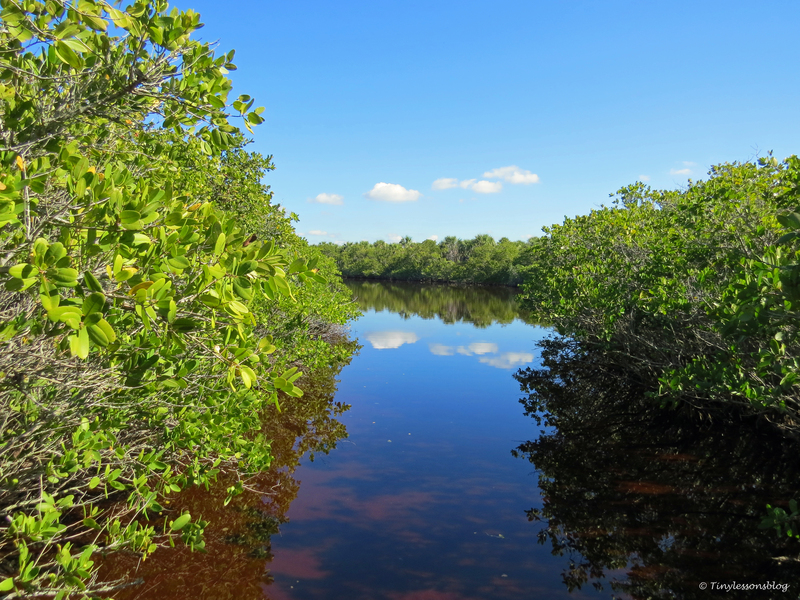 The tranquility of Caladesi Island was tangible. Being dipped so deep into untouched nature was inspirational and soothing for the soul. Like coming back to my real origins.